Thanks to Dr. Sean Williamson, Indiana University School of Medicine, for contributing this case and the discussion. To contribute a Case of the Week, follow the guidelines on our Case of the Week page. (1) We have added links for free CME from ARUP, Johns Hopkins and PILOT to our new CME page, which has a link on the left side of the Home page. (3) Last year we had 3.5 million visits! Thanks for your support. 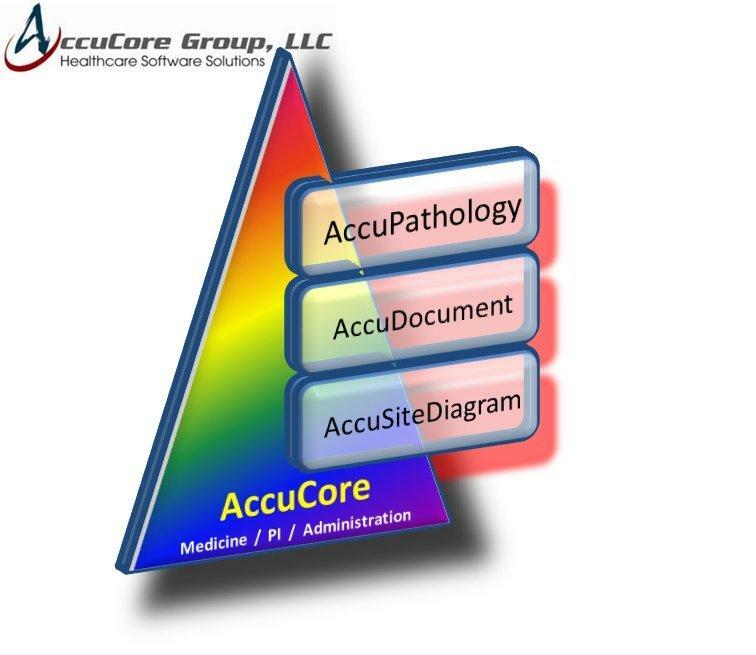 (4) Our Feature Page for the month highlights Billing / consulting / management, and includes AdvantEDGE Healthcare Solutions (AHS), Pathology Service Associates, LLC and Vachette Pathology. Also check out our new monthly Mystery Image, on the right side of the Home Page. The patient is a 71 year old woman with end stage renal disease and acquired cystic kidney disease secondary to diabetes. Five years after renal transplant, surveillance ultrasonography revealed complex cysts in the native right kidney, up to 1.9 cm in greatest dimension. 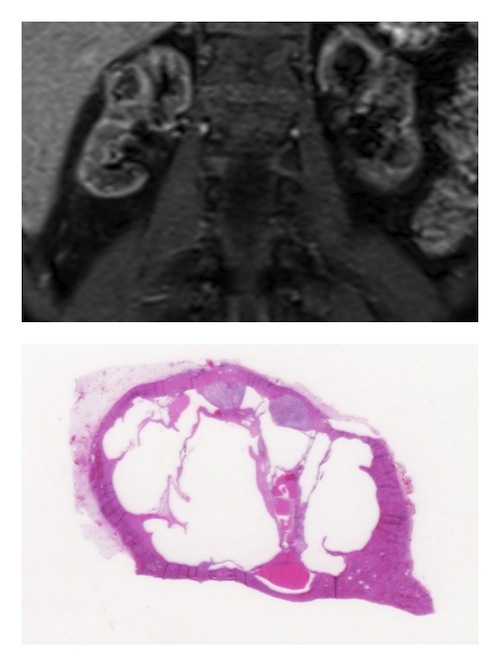 Renal MRI confirmed the presence of multiple complex cystic lesions in the bilateral native kidneys, including an enhancing nodule within one of the lesions, concerning for malignancy. Bilateral nephrectomy was performed. Gross examination of the native kidney nephrectomy specimens revealed multiple, bilateral, complex cystic and focally solid lesions, ranging in size from 0.2 to 2.0 cm in greatest dimension. 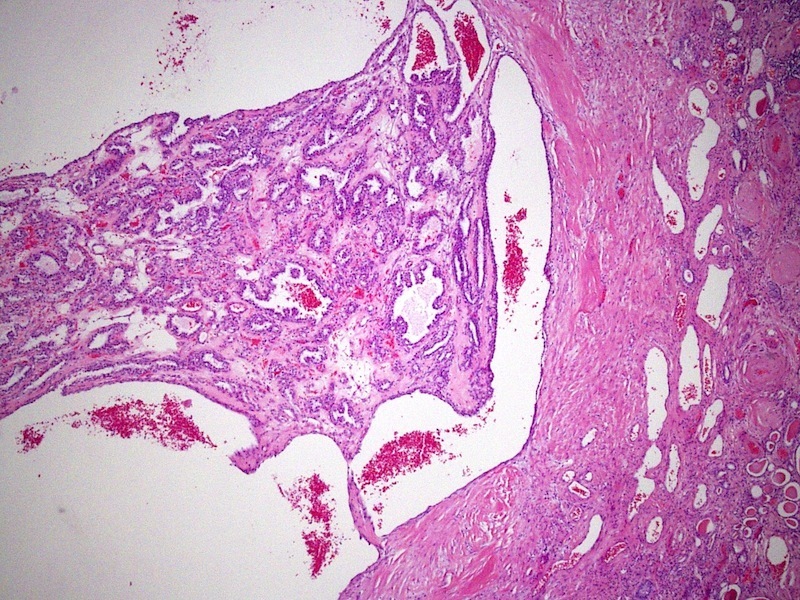 Microscopically, all of the tumors demonstrated similar histopathologic features. 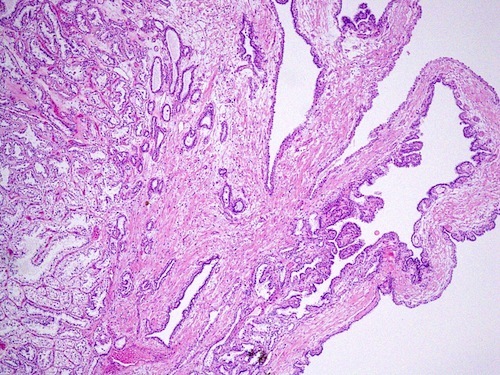 Clear cell papillary renal cell carcinoma is a recently identified renal neoplasm (also known as clear cell tubulopapillary renal cell carcinoma), originally described in the setting of end-stage renal disease and acquired cystic kidney disease (Am J Surg Pathol 2006;30:141). However, tumors may also be found in patients with otherwise normal kidneys (Am J Surg Pathol 2008;32:1239). 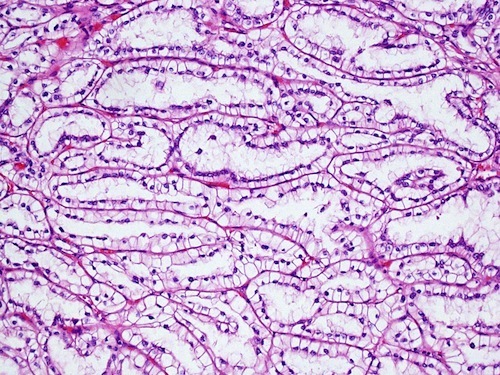 Clear cell papillary renal cell carcinoma has distinctive histologic features, though sometimes showing significant morphologic overlap with clear cell carcinoma or papillary carcinoma. 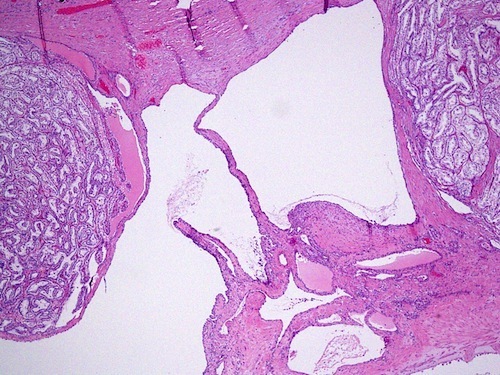 Architectural features include a mixture of cystic, solid tubular/ductular, and branched papillary architectural components, combined cytologically with variable amounts of clear cytoplasm (Am J Surg Pathol 2010;34:1608, Histopathology 2011;58:1064, Am J Surg Pathol 2006;30:141). Often, at least focal areas show alignment of the tumor cell nuclei away from the basement membrane, similar to secretory endometrium. Other features include a branched configuration of the ductular/tubular component and occasional calcification within the fibrous septa. Although the tumor is named for the combination of clear cell cytology and papillary architecture, large, extensively branched papillae are not the predominant component in many cases. 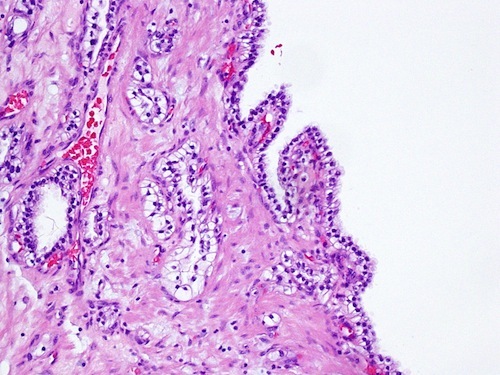 Some cases may be predominantly cystic, mimicking multilocular cystic renal cell carcinoma. Most show low-grade nuclear features (Fuhrman grade 1 or 2). 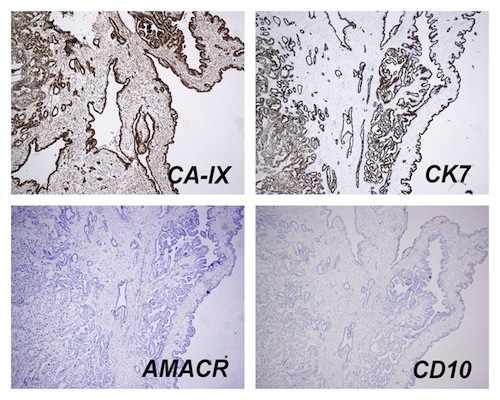 By immunohistochemistry, tumors show expression of carbonic anhydrase IX (CA-IX), similar to clear cell carcinoma, and cytokeratin 7, similar to papillary carcinoma. However, unlike clear cell and papillary carcinoma, CD10 and AMACR (P504S), are generally negative (Am J Surg Pathol 2008;32:1780). A characteristic molecular-genetic abnormality has not yet been identified. Some studies have found low copy number gains of chromosome 7 or 17 in a minority of cases, similar to, although less frequent than, papillary carcinoma. In contrast to clear cell carcinoma, abnormalities of chromosome 3p and the VHL gene are absent, although expression of CA-IX, HIF-1α, and GLUT-1 has led to the hypothesis that there is upregulation of the HIF pathway by a non-VHL-dependent mechanism (Mod Pathol 2011;24:1207). Prognosis in tumors reported thus far has been excellent, with no known metastases or aggressive behavior.